Manheim offers customers a wide range of solutions for vehicle rectification. Offering the most modern repair techniques, we ensure your vehicle/s are quickly restored to the best condition for the sale. Our services focus on repair rather than replacement, offering a swifter and more cost effective method compared to traditional repairs. Vehicle detailing improves your vehicles presentation and, if you’re selling, increases it’s value and chance of a successful sale. Manheim offer a range of vehicle detailing packages or you can tailor your own package to suit your needs. All detailing work is carried out at Manheim operating locations by our highly trained team members using environmentally friendly cleaning agents. 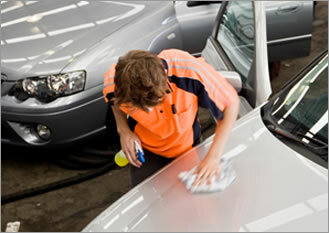 pdf Manheim detailing services brochure.